Before starting to present how to set your custom domain, let’s take a moment and talk about what a domain name is. A domain name, like http://www.example.com, is a lot like a street address for a house or business. It’s the address or the URL used to identify a web page. Subdomains, like http://shop.example.com, are the prefixes in the address or URL before the root domain. Every Soldigo store gets a http://yourstorename.soldigo.com/ domain name. If you already own a domain name or you are planning to purchase one, you can connect it with your Soldigo store. 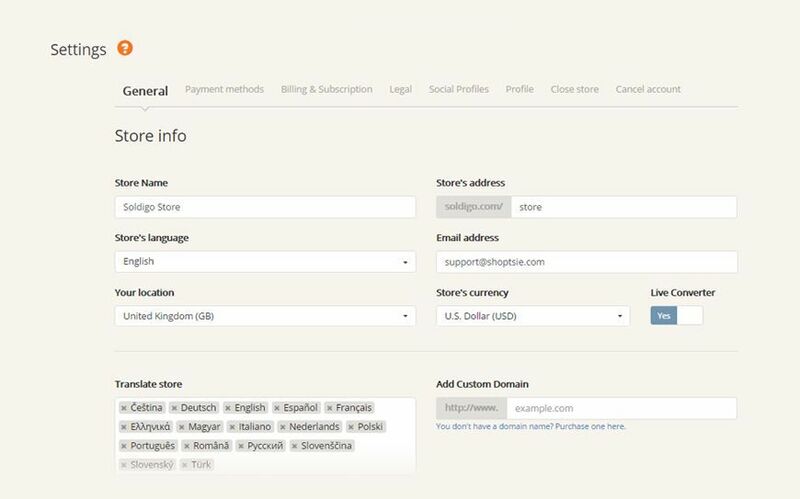 This way your store’s domain name will be yourdomainname.com instead of yourstorename.soldigo.com. Why to purchase a domain name? Increase brand awareness – they say first impressions are lasting impressions. First thing to do in order to connect your own domain name with your store is to point the A-record (IP address) of your domain name to our IP address: 13.69.190.134. If you need help doing the configuration, ask your registrar for the instructions. Tell them that you need assistance pointing your domain to Soldigo’s IP address. Secondly, you will need to tell Soldigo what your domain name is. You can do this by accessing the General tab on the Settings on your Soldigo dashboard. Here, on the bottom right, add your domain name and click Save. This entry was posted in Settings on April 9, 2018 by shoptsieblogadmin.